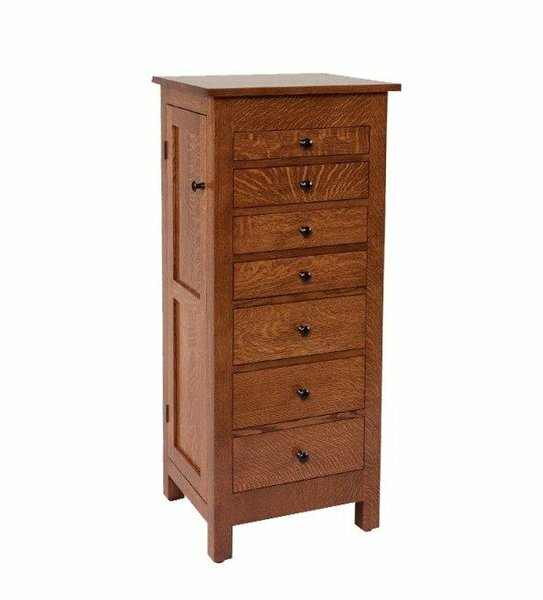 Embodying the clean, simplistic approach to furniture crafting that has allowed the Mission style to remain popular for so many years, our Amish Made Flush Drawer Jewelry Armoire has a beautiful design that is perfect for any decor. From the large flat fold up top, to the flush mount drawers and raised panel sides, the emphasis on this piece will always fall on the natural grain patterns of the solid hardwood, providing a beautiful warmth to any room. Customize your jewelry armoire and make it your own - with nine available hardwoods, multiple finish options, your choice of hardware and a unique color for the velvet drawer lining, the possibilities are endless! Also perfect as a gift for that special someone, the Flush Mission Jewelry Armoire comes fully assembled, with a finished back, dovetailed drawer boxes that glide on smooth full-extension slides and necklace cabinet sides. Give her something that she can love and enjoy that can also be handed down and enjoyed by many generations to come.